Great app for tickets. I use this all the time. I enjoy the great prices I find , helps out in a high cost economy. When ever I need to buy a ticket to sport or musical event, my first choice is GeekSeat. Order was very easy to process. The app is very user friendly. The deals offered were amazing. Excellent experience using the app! Easy to use and I love it includes the fees in the price when I’m searching for tix. Easiest ticket app to navigate and best deals! The background check, clearance, and confirmation process for the sellers clearly does not have good confirmation of quality. The day-of tickets were never processed and the bank reported the charge as fraud. After 2 hours spent on customer service where calls were disconnected and ended by the customer service representative, we finally got on the phone with a manager who cancelled the order. Had to discontinue the card used to purchase the order to prevent future fraud. The Pat McAfee Show taught me that buying tickets is no long complicated and confusing now that I use SeatGeek! I’ve bought tickets to three concerts this summer through Seat Geek, ALL my sets have been fantastic. So easy to use!! Love it!!! I use SeatGeek all the time, I love that I can go to any event in the greater LA area and know I can find tickets on Seat Geek!! Great selection and value. Would like to see the view from the seats I bought. Best app to buy tickets! Great app to buy tickets. Good selection and enjoy that they list the full price of the tickets including fees! Recommend this app to buy your sports tickets. Seat Geek always manages to find great seats at a great price. Got seats for a matinee showing of Wicked only a few weeks out. So glad I used this app! I will not get tickets for events anywhere else. This app is a scam!!! Don’t do it!!!!! I clicked on a ticket in the 200’s to purchase for $159, but when the ticket was delivered, it was for section 420. I called to explain what happened and they said no you did purchase that ticket. I never purchased a 400 level ticket EVER, why would I start in my 40’s?!?! Then I contacted the third party seller, they suggested I resale the ticket. When I clicked sale ticket in the app, it suggested I sell the $159 ticket I just purchased for $65!!!!! Save yourself, don’t do it!!!!!!!!!! Tickets were never valid, I showed up to the event & tickets wouldn’t scan. I called seat geek customer service she told me to tell them to type in barcode manually (they did) didn’t work. I emailed SeatGeek about the whole mess & all they offered was a 20 dollar discount off my next purchase when I spent 300 dollars on the fraudulent tickets. There is no credibility in these tickets, I’d suggest using another app. Rely on this. Best ticket site / app we have available. I only get tickets from SeatGeek because they make it so easy as a ticket buyer. I have bought tickets same day and never had any issues. The one issue I did have with a pair of tickets SeatGeek went above and beyond to make sure I was happy. Two thumbs up! The ease of seatgeek is undeniable. But if you have to sell your tickets, they make it way too difficult. We bought Shakira tickets and Shakira canceled. They rescheduled the concert five days later. You don’t have the choice of a refund. A friend who owns a big ticket sales company said about this: “there’s what’s right and what’s legal.” Legally they have a right because it’s in the terms of purchase. But ethically it’s wrong. And there is a choice to purchase from sellers who do the right thing. We can’t go to the concert the night it’s scheduled. And they wouldn’t refund our money. When we tried to list the tickets they said it takes three days to verify the identity of the seller. So you can buy the tickets in 5 minutes, but when you try to sell on the same site there is an issue. I hope they get their sh*t together because the app is great. But the people behind the app don’t want to think long term about keeping customers loyal. It’s not a monopoly which means there is choice. My choice is to delete the app and buy from people who care. Convenient. Decent pricing (I guess). Wish they covered parking too. Great Company to order tickets from! Great experience with SeatGeek every time I have purchased tickets for music concerts & baseball games! I recently had issues with the bar code and QR scan printing on my ticket. After contacting SeatGeak about my printing problem, they proceeded to explain that I must print the ticket because my venue didn’t accept mobile tickets. After asking them to re-read my first contact and explaining again that this was a printing issue, I was provided a pdf of my ticket that didn’t print the bar code or QR scan. Reaching back out, I again explained my issue and was sent the ticket as a photo within an email and was told to present the email as my ticket, even after being told that my venue didn’t accept mobile tickets. The representative did not read my email and did not offer any solutions to my actual problem, other than to show a copy of my email when I arrive at my event. I will be selling the ticket and will no longer use SeakGeek for purchasing tickets in the future. Easy, user friendly, fast. Shows seating chart and photo of field view. SeatGeek is my go to when I need Astros tickets. Always find good tickets at good prices with plenty to chose from. Would recommend to anyone. I’ve bought tickets three times so far from SeatGeek. Great deals and excellent seats behind 1st baseline. I haven’t had problems so far! Love it so easy to use!! Seat Geek make purchasing tickets for all events easy. I give you 5 out of 5 stars👍🏻. Thank You!! Outstanding! Was super nervous when I only had a digital ticket for an upcoming NFL game. Unbelievable email response time and detail they put in to make sure I knew where to go to print one out. Oh and way easier to find a front row seat on their app compared to others. SeatGeek comes through again! My go to whenever I’m looking for Sounders tix or Foo Fighters! Always beats the prices on the other apps. Good prices for tickets, and easy to use. Shane brought me here and it’s amazing!! No idea why my credit card was charged $1 just for entering my credit card info on the app. What’s up with that? So easy to navigate and to organize the tracking and buying tickets for all my favorite events! Works perfectly and is easy to use! Okay will Shane brought me here. I love how you could pay for tickets without being scared! I love going to Football games and all concerts! The best thing about seat geek is that I something pops up and you can’t go you could either sell your tickets on the app or contact there customer Service there service is so fast they littered only take like two hours too respond to emails !! I’ve tried to use SeatGeek for 3 events now and every single time, the tickets on SeatGeek were almost twice as expensive as on the venues’ websites. I’ve yet to attend the games I’ve purchased for my city’s soccer team...but I’m stoked on how easy it is to look through all the seats and different price points. It is my go to solution for date night, an event with friends, and late game tickets. The process is seamless and it seems like they do everything to minimize fees as compared to other companies. Wish there was an option to add more ticket with close by seats after initial purchase. Other than that, love this app! Love that fees are included. Always reliable. I have been using SeatGeek for a couple years and wanted to give it some time before writing this review. I must say this app is amazing! I can always find a great pair of inexpensive tickets for what ever I want to see. It all comes down to timing, once you’ve master that aspect you’ll always find what you’re looking for. This app is amazing highly suggested if there are event you absolutely don’t wanna miss. SeatGeek is there for my Sporting Event needs! The filters help me know what is available and the best deals feature lets me weigh the value. Couldn’t be happier! Got a bunch of tickets on Seat Geek, it’s easy and I’ve gotten a lot of great deals. I love how easy it is to find a great deal via this app. FANtastic app to find sports tickets ! I have used SeatGeek on numerous occasions for concerts, the Theatre and sporting events, I have always been pleasantly pleased with the venues and the location of our seats! I highly recommend SeatGeek! Easy and fast - buy tickets instantly. Sell your tickets using the app’s suggested sales prices or choose a higher or lower amount. Bringing a friend? Instantly send the ticket to them for free or for a fee, and let them use their own phone at the gate for entry. All in all, the most convenient ticket app out there. I’ve used seek geek many times and it is always a reliable, fun way to purchase tickets, and have them readily available to redeem. I love the wide range of tickets offered. It could be a baseball game or concert ticket. The App is a must for your smart phone!! I ordered my ticket 2 weeks in advanced. They told me I’d have it no later than the 18th. I got a confirmation for my tickets on the 14th saying I will receive them that day- but I didn’t. It’s now the 21st and I still have no tickets because they sent it to the wrong person!!!??? I don’t even think I’ll be going to this event anymore and I’m so disappointed. I don’t want to risk using this app again. I feel safe every time I purchase tickets in this sight. My personal info is safe. I feel I’m always getting the best prices and the service is super fast and easy to navigate. Highly recommend for sports, concerts and all events. Conned out of my tickets. I’ve been a loyal user of the SeatGeek mobile app for several years. Never would recommend this app to anyone ever again. It used to be my go to for concerts and sports in my city. However, after being scammed out of tickets I purchased by a seller, and dismissed by customer service I’m done with it. There are no protection in place for buyers on the app. Meaning that even after completing a transaction, listers can track rising tickets prices and sell duplicate tickets, then just cancel the cheapest transaction. Which is exactly what happened to me. SG customer service reps were disdainful and unhelpful. You’re better off using more reliable StubHub, TicketMaster, or good ol’ brick & mortar box office. 10/10 would never do business in SeatGeek again. Very easy to navigate and the rating system lets me know what is my best option. I went to my second concert last night, decided to give this app a try and wow was I amazed it was super easy to use and I got into the event with my phone didn't even have to print out the ticket. SeatGeek you did an amazing job on this app five out of five stars will definitely recommend to another person thank you! Love this app. Easy to use, great visual of seats. Always get great tickets and great prices!!! Quick and easy. Love the fact that the price you see is the price you pay (at least in my experience). (Would’ve left no stars if I could’ve) I bought tickets for an event, the event got rained out and rescheduled. Seat Geek gave me no updates, no emails on the event, when it was rescheduled I asked for a refund because the new date would not work with my schedule. Customer service was absolutely terrible, when explaining the situation the guy kept interrupting me with “uhuh” without even listening to what I was saying, and answering with his response that he couldn’t refund it, and that because “the venue” isn’t issuing refunds neither are we. I left an email, got no response, I called customer service one time, she said she would call me back and didn’t, I called back a second time and the guy couldn’t get me connected with the supervisor after waiting 20 minutes on the phone, I honestly will NEVER use this app again. And if I would’ve read the reviews before downloading I would’ve went to one of the competitor. Ticket master is refunding Idk why seat geek won’t. Love that you can see the actual final ticket price while shopping and preview the view from the seats at all venues. Definitely a more accurate seat buying process, you really know what you are getting for your money. Could not even get the app to open. Waste of time. Good selection of seats at fair prices. Digital tickets work well. Thank you very much for existing! Tickets were ordered and confirmed, but not delivered in time for the event. Customer service just kept saying they were trying to contact the seller and they wouldn’t refund. Horrible experience and won’t use again. Love seat geek, shop all you want their prices beat all. Easy and convenient, no better way to take 7 people to a ballgame!!! I ordered a BTS concert ticket and got a Emil telling me that my order was cancelled. I called and ask and it seems that someone got the ticket before me. They should have told me before I made my purchase. I have not got my Money back yet but I will update. Always buy event tickets here! For great prices!! Instead of showing the exact seats, the only show the row. The website allow to see the exact map of the seats. It is an idiotic feature design that provides no value as is. I have tried comparing seat to seat with other ticketing agents. No one has beat them. Easy to use too. Best ticketing app for EVERYTHING we want to do!! Used to like this app, but kept on screwing up on me. This often ended with me on phone with customer support outside of venue I was trying to get into. Customer support was pretty terrible and never offered any sort of discount for your troubles. I have used stubhub, vivid, Barry’s, axs, and other ticket marketing places. Overall this place is the best. I would say 90% of the time they have the best price for the seats you want. Pirates tickets. Been to to games. Both winners. Seat Geek and the Bucs!!! Seat Geek is surprisingly really good. I’ve used a few of the other ticket apps and they are expensive and charge pretty high fees. The app is super easy to use and works well at the ticket line getting in places. I haven’t had any troubles at all and I’ve been to 10 events using seat geek with my girlfriend. Big Fan!! Avoid them at any cost they take your money and tel you your ticket was not processed successfully and refund will be made shortly. Still waiting for my refund and they don’t answer my calls or emails. Always easy to use and usually the lowest price of the ticket services. Have started using this over stubhub. 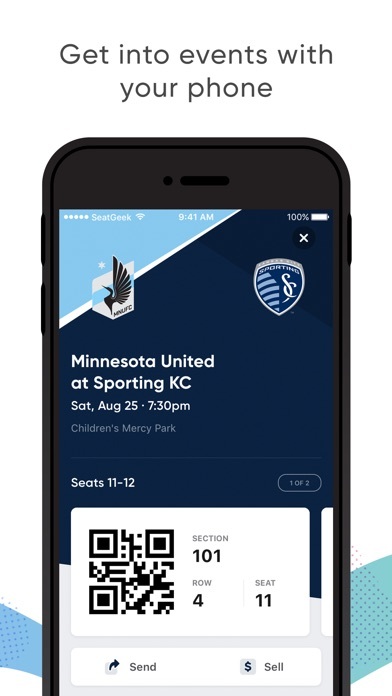 Not only are they partners with LAFC its aneasy to use app. I'll be scrolling for the next concert and I'll see someone I like and get hyped and then I see it's in Los Angeles, I don't even live in California. Why can't I just only see things that are in my city? I’ve been using SeatGeek for several years now, and it’s absolutely the best app there is. Period. From being able to see tickets for the whole venue, to comparing values, to ease of use...my favorite aftermarket ticket app ever. It makes it too easy to indulge my live event fix. Great app! Great service! If there’s an issue, a person actually solves it on the phone when you call! Great app to see multiple listings for sporting events. Great customer service. They really want to make you welcome. Have been using for a few years now. Keep making this service great. I am positively surprised how SeatGeek has figured to make complicated functionality look simple. Impressive and in awww. Thank you guys! My favorite App! Pretty easy app to use, I’ve ordered tickets and sold tickets before. Easy and simple way to get tickets to the best functions! I’ve purchased tickets to numerous events on Seat Geek with no issues. For sporting events, I love the field view feature. I also appreciate the filter options and the good deal/ bad deal categories. Honestly only place i buy tickets!! They always have the lowest prices and fees, i have never had an issue with this app! Everything is cheap and easy!! I have been using SeatGeek for a couple years and wanted to give it some time before writing this review. I must say this app is amazing! I can always find a great pair of inexpensive tickets for what ever I want to see. It all comes down to timing, once you’ve master that aspect you’ll always find what you’re looking for. Usually get my tickets with this and it's easy to use at the stadium. Just scan and go! Nothing but easy and smooth experiences with the SeatGeek app. Love the ease of use, and how I can see future shows as well as my upcoming events, just so quickly. Just walk up to the venue with e-tickets on my phone and in we go. Saw Imagine Dragons, and going to see Bill Burr, Ozuna, Phil Collins all with SeatGeek. Can’t wait!!! Seat geek sold me tickets to a logic concert in Phoenix az. When presenting the verified, seatgeek confirmed tickets I was denied access and told that someone else already used MY tickets. Seatgeek sells a singular ticket to multiple people and the first to get into the venue takes the win and every other person WITH THE SAME TICKET loses. I have approached seatgeek for a refund and I have not seen a reply. This app WILL SCAM YOU. I was told from the venue I was at to buy from ticketmaster as they are the only trustworthy app that will sell you real tickets that are authentic to you only. I still want my money back. Only good for seat views. Hey SeatGeek, When I went to check tickets for an event I found, your app told me that a $76 ticket was a “Great Deal” when I went to the venue’s site I found the same ticket for $39.50. Why wasn’t your ticket price listed as terrible? 🤨 A fluke, right? That’s what I figured, so I went and checked other things; sporting events, concerts, comedy shows, etc. EVERY event, not a few, not a couple, every single event you had tickets listed as “great deal”. In the 30 seconds it took to look for tickets elsewhere, I found seats in the same section, or area for nearly half your price. What gives? I will never ever download this app or use this app again I purchased two NF and logic tickets at auction pavilion. And we go to get through and the tickets have already been used the manager pulled me and my cousin the side and we went into this back room and she looked up the ticket and it look like somebody already used it and they were selling used tickets on this app she said it was a third-party which means they get tickets and sell them and you will not be able to enter the stadium. I’m so disappointed and upset but that’s just a lesson learned!! Always have the best experience using SeatGeek!! I love this app. With Apple Pay setup I can buy tickets in like 30 seconds. The interface is really easy to use their “deal score” system seems legitimately useful. Easy to use and all features work like they’re supposed to.. I purchased tickets and never received them, I called Customer service and they said the would upgrade me or find replacement tickets. When I got a call back they tried pawning me off onto the sellers customer service, claiming they are a broker. Horrible experience, I have spent over $1000 in less that a year, made no difference and they didn’t care. I’ve bought tickets twice so far from SeatGeek and attend two Detroit Tigers games with the tickets. Great deals and excellent seats behind 1st baseline. Of course it depends on what you’re looking for (me? NY Mets tix...yeah I know) but got very good seats for a very reasonable price. Game is a couple of weeks away so I hope the 5*’s are not premature. I use this site to get awesome tickets. Always great knowing exactly what I am going to pay for my tickets with no hidden fees!!! I’ve literally gotten so many friends to use this app with there awesome referral program, tickets are put into your account generally really quick. Easy to use. Couldn’t recommend enough. Generally i check multiple apps for pricing and seat geek is usually one of the lowest after fees are taken into account! App works greet and you can always find cheap seats. As someone who lives in Orlando, FL and recently got into basketball after the 2018 NBA playoffs my friend and I made a commitment that we were going to see as many home games as we could to cheer for our local team and see all of the stars the NBA has to offer. We started out in the nosebleeds with $15-30 tickets and just enjoyed being a part of the arena. Then we jumped to $70-90 tickets to sit on the outter edge of the middle and that was cool. Finally the Mavericks came to town and we looked at each other and said, "dude, we gotta get good seats for this one. We have the money, lets stop being stingy and just do it." That was when i downloaded seatgeek after hearing about it on the Bill Simmons Podcast for the past year. I looked at the prices and there they were...3rd row, about 50 ft from the visitors bench and only $130 each. DONE! That game changed everything. Seeing the action that close and sharing the moment with my buddy who was just as stoked as I was; we can't go back. I CANNOT go back to the nosebleeds and I owe that to seatgeek. They've hooked me up with tickets within the first 10 rows for the last 4 home games and i just bought my playoff tickets in the same spot. Thanks BS pod for putting me on to seatgeek and thank seatgeek for the sweet deals! So easy to use! Only place to buy tickets! Have spent hours trying to access my tickets to a baseball game and they keep sending me the same list of instructions that I have already told them is not working and causing error messages. Won’t be going to the game and they are refusing refund. I was terribly disappointed to find out that the site didn’t come close to providing me with what they were calling a “Great Deal”. I purchased 2 tickets to a MLB game using the site and realized I needed a parking pass. They had 2 options so I looked online to figure out if one lot was better than the other only to find out that I could purchase a parking pass from MLB.com/Ticketmaster for almost half the cost ($22 vs $38). This led me to investigate the price of the tickets, which I found out I overpaid for by $50!! ($218 vs $168) !??! Again, this wasn’t on some discount site. I found available tickets at a cheaper price on a very conventional site (MLB.com/Ticketmaster). Maybe they’re useful for less available tickets, but don’t take them at their word that the prices are an “Amazing” or “Great” deal as they claim. Do your due diligence. Easy to navigate with full price shown with fees. No surprises!! the ticket prices seem low and then they hit you with $15 fee per ticket. i’m not gonna pay $30 extra dollars when i can just go on ticket master. sorry!! I will never recommend anyone use this app. I bought tickets from the “presale” the actual Ticketmaster tickets were cheaper and closer. Don’t buy through SeatGeek, especially concert tickets. You can’t even call customer service, what kind of help is that? An online chat won’t help anything. Enjoy getting tickets when other venues don’t have it! So easy and reliable to use. Thank you ! SeatGeek is great for last minute ticket purchases. I use it all the time for baseball. Fantastic! Waited a week for tickets!! After I had purchase tickets to the padres game. I waited for almost a week to receive my tickets. I had to reach out to customer service and they had to reach out to the seller. I wouldn’t suggest this app. Don’t get this app, I downloaded this app because a YouTuber I watch always gets sponsor by them, so I wanted to give it a try. I was looking for concert ticket, they try to sell you ticket on fake days. Easy to use; great comparison features, good prices. I rely on SeatGeek to get what I want when I want it. Easy to use app when I’m home OR on the road. One of the greatest apps to buy tickets through, out there today. I was able to go to a San Jose Sharks game for my birthday on February 2nd and getting the tickets was quick easy and cheep. I also love the feature of getting a viewpoint of your seat before buying it. I’ve been using this app for over a year now and it’s amazing! Nothing but positive experiences. Good customer service, fast ticket delivery. Useful deal score & price searching features. Highly recommend. This app always has the best ticket prices available! Additionally, their customer service (which I have only needed once in over 50 orders) was excellent and quick. Truly the best app for ticket purchases! I accidentally created two SeatGeek accounts..one through my gmail and the other through Facebook. I can’t seem to merge them. Other than that, it’s fantastic. Place to go when you need tickets! SeatGeek site is quick and easy to use and they always have tickets to every event you need. The hidden seller fees are a bit annoying, we all know they are there so just add them into the price so you don’t have to click into each one to get the real cost. All in all a positive experience. rivals Stub Hub for sure. they automatically show the fees unlike Stub Hub. when it comes to dodger tix, the last four occasions, i've gotten a better deal w Seat Geek. Same w/ concert tix! Greatest website for purchasing tickets. Seat Geek makes it so easy to find not only the best tickets but also the best deals. There is also an option that allows you to see the final price of the seats including seller fees so there is no sticker shock at checkout. This is super important because one of the other websites was quoting a price but after entering your credit card information the actual price was over $100 per ticket higher. Amazing app! Good prices and very user friendly. They also show you an image of exactly where your seats are located. There is no point to this service, the tickets are bought and distributed through ticketmaster. You need a ticketmaster account just to receive the tickets, Seat Geek does nothing but charge you fees for ticketmaster’s service. Best place for buying the best deals on tickets. Love the deal scores and the option to include fees in your search. Nothing hidden at the end. Makes it easy! Not only do I always find the best seats at the best prices but they always provide great customer service. Picture this, I’m at the event and I have problems with my tickets at the gate because of my own ignorance (my husband’s ignorance) and Seat Geek solves the dilemma for me at the gate! I’m in and the rest is history. David Dobrik showed me SeatGeek and I’m so glad he did because SeatGeek is the best!!! Always a go to for tickets!! Great app! Sold bogus tickets. Ruined our work outing because we couldn't get an employee in. Use another app. This app is great for finding tickets for Hockey for my family. It’s fast, easy and really helpful with picking the actual seats. Anyone in New York getting screwed by this company, they in your back yard do everyone a favor and get this fraud building shut down. I shop around pretty extensively for tickets, and have tried many sites. The user experience is the best, prices are always in line or a little better than other sites, and I love that make it easy to see the total price including all taxes and fees when searching. I have found this app easy and quite useful. I use it mainly for Sporting tickets. Great, easy to use app! I have the three popular apps for purchasing tickets and I love how SeatGeek simplifies the search and offers a clear map of the seat positioning - which is exactly what I want to see before purchasing a ticket. Keep up the great work, SeatGeek! Have been using SeatGeek for years. Love how it rates the prices. Have never been disappointed. They make it quick and easy to buy tickets to various events, and you can sort with fees included as well, so you always know what you’re paying up front! I like that I can see how much the fees are. That way I’m not surprised at checkout. Favorite app for basketball tickets. I like how it shows price with fees included. Makes it a lot easier for me to decide. Punch Drunk Podcast got me to download the app and I use it frequently and it’s great. Needed a quick, inexpensive ticket for the game. Site was easy to use & $4 less expensive than other sites. I will use this site again! The only way I buy tickets - I love the ratings & vivid view of the seats. Code MMG for 20 dollars off first purchase. When I looked on this app and were looking at a certain seat for an Ariana Grande concert, the price was 130 dollars more than when I called the arena to see how much the tickets were there. So seat geek was trying to charge me 130 dollars more than the arena itself. Plus the sellers fee was 40 dollars extra than the arena itself as well. Easiest way to see your seats and buy tickets. Excellent App. They say “to find the best deals” yet I compared multiple concerts and I still found them cheaper on Ticketmaster and stubhub. This may be good for some things, but defeats their goal when I have to check other prices because they could possibly be better. Seat geek really gets great deals. 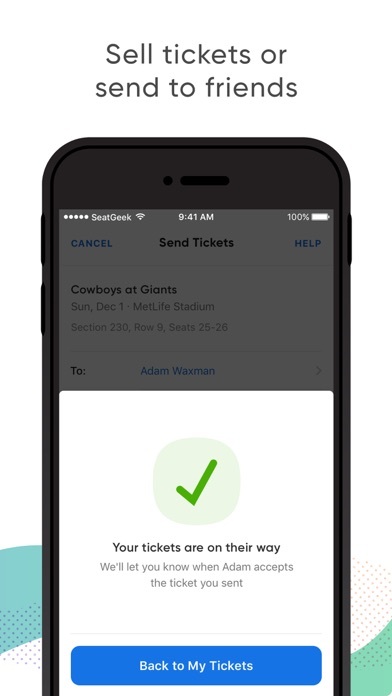 SeatGeek showcases the intuitive simplicity that makes the best apps shine. It’s very easy to interact with in terms of buying tickets. I love the visuals of the concert venues, the ability to easily browse through options, viewing prices, including “going back.” Checkout is also a breeze. Highly recommend! This app is the best because there is no okie doke costs...what you see is what you pay including all fees!!! I used SeatGeek several times now. There are a couple things that work well for me. I like that they show you what it cost with fees as a search option as well as before you purchase. I purchased tickets for the wrong date. Called in and got Cody. He was VERY HELPFUL in that he spoke with his manager and was able to give me a credit to repurchase tickets to the correct event. EXCELLENT CUSTOMER SERVICE!!! When I list tickets on SeatGeek they sell. App works great for our tickets!!! Always an easy way to get cheap tickets that show you the prices with fees, saves a lot of time and aggravation. What’s not to love? Instant download of tickets, Apple Pay enabled... the only way it’d be better is if the tickets were free! I bought tickets months in advance for an event only to get an email a couple weeks before the date saying they double sold my tickets. They told me the only thing they can do is to downgrade my tickets but for the same price. As I was on the phone with them I checked their site and saw computable tickets for the same price. Meanwhile the tickets they moved me to we not even available. I repeat DO NOT USE THIS APP!! I always find a better deal on seat geek than any other ticket reseller. The app is really nice too as it explains if you’re getting a good deal or not. Quick, Easy, Efficient! Love the app and ease of purchase. Like that you can zoom in and see the actual row detail. I recommend sticking to Ticketmaster or stubhub! This app is nothing but a scam!! Stay away from this app it is a SCAM!!! Easy to use, good place to find great tickets. Buying tickets for a hot show it’s never easy.This site along with it graphics makes things so easy Very cool. Great place to find affordable tickets and the process is simple. 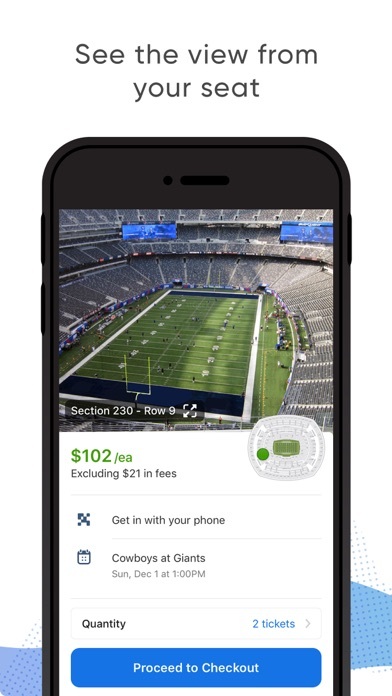 The SeatGeek is easy to use and easy to access when you’re going to security. It makes paper tickets obsolete!! The boys from Pardon My Take brought me here a few years ago. And love it. Not only do I get my tickets here when I hear about an event, but plan weekends and trips around the upcoming events thanks to SeatGeek. It’s the only way to get your tickets. Great and convenient. Make it easy and fast to get to your event. Don’t waste your time on this app. Ordered some pricey tickets, got charged and everything, but they never showed up. Ticketmaster is much much more reliable and easy to use. I bought so many tickets on this app, it’s very reliable! I honestly love this app, if i need to find a sports event or concert tickets, seat geek is my go to app. It should be yours to!! It was my mistake for not reading the reviews and going based on the ratings on this app. But it’s all a mess with lots of worrying due to not knowing if you are going to get your tickets as they provide them literally 2 days before the actual event. & there is no way to can cancel your purchase as they will not refund any of the money. Then upon further reading the reviews there has been cases that their tickets are sold more than one time, so beware if you do get your tickets but as you go into the event your seats are already taken, such disappointment if the event is already sold out. Do not recommend although I was able to get my tickets on time & we go in to the event with no problems, It had me worried as I purchased these tickets 2 months in advance just to find out you receive them two days before your actual event. I do repeat myself as this cause me so much stress & I do not recommended to anyone. If you do purchase your tickets on this app, all you can do is hope as I did that you didn’t get scammed by this horrible app. The App works great! Very easy to use. Great tickets usually best prices. I just bought 2 Sharks tickets and Seat Geek made it really easy to identify the available tickets by section & row along with the price. Finding the seats I wanted took just a few minutes and the checkout process took less than a minute. Very easy all around! Can’t wait for the game!! Seat Geek is my go to app. Their website is easy to navigate and understand. They also make it easy to tell if tickets are a good deal. I do not know how they do it but they are consistently the best priced tickets. The ease of use is particularly helpful when going to new out of state concerts, as I have a better understanding of seat position and value in unfamiliar places. I use an iphone and for whatever reason other ticket sales apps/websites are very confusing on an iphone...esp ticket-masters . The only thing i do not like are the high fee’s, but you get that from the others as well. Very user friendly. Ticket prices listed with all fees include. Great customer service if you have any questions/concerns. Love this site. It’s my “go to” for all ticket purchases! The IOS design is amazing. It’s fast to navigate, easy to find the best seat, and the price you see is the price you pay! First SeatGeek experience was nightmarish as tickets didn’t scan but customer service rep Elliot was super apologetic and very reassuring. She stayed on the line with us and sorted everything out and we got better seats than the tickets that didn’t scan (super rare by the way). Just bought my second lot of tickets for the Giants game next week. Amazing deals with awesome seats!!! This is a great place to buy and sell tickets and the prices are more reasonable then other services. I absolutely love using Seat Geek to get my tickets. My best friend and I want to see a game at every NFL stadium, so you can imagine I have spent my fair share of time looking on ticket sites. Seat Geek is definitely my go to because they let you see prices including all of the fees that other sites choose to surprise you with at checkout. I am going to stay loyal to Seat Geek for that reason! Buyers beware. Purchased tickets for a gift that were outlined in a specific section, and what came through was not even remotely close to where the seats were displayed to be. Although the have a "money back guarantee", and no clear T&Cs outlined, they insisted mine did not qualify and could not produce said terms as proof, and refused a refund. Unless you're buying for a sports game, or don't care where your seats are, you can find tickets cheaper on StubHub or even Ticketmaster, with better customer service and better seats (I wish I had). I love, love, love this app! It always shows you the best deal for your money, I've never been disappointed! I accidentally ordered the same tickets twice. I contacted them immediately and they refused to cancel the order and said I owed them the money. Their system for mobile tickets is totally confusing, you don’t see any sign of the order until it is confirmed making it nearly impossible to cancel. Had to work with my credit card company and dispute the charge. Be very very careful. They will stick you with the money. Great service! I’ve been using Seat Geak for a while now and always had outstanding service! I’ve bought tickets to multiple events using seatgeek and mostly because my favorite youtubers have promo codes for this site and I️ can’t help but use them. Great experience thus far. Just last night I️ had trouble listing some tickets for sale because I️ unfortunately cannot make it, and this would be my first time needing to use the chat to contact support and they resolved my issue immediately. I️ was impressed! Very very easy to use, no hassle, no complaints. I love seatgeek ! Have stopped using the other ticket app’s since learning about Seat Geek. Always Always reasonable prices so far never an issue. So I had an email for 10% off tickets thru vivid seats that stated out $52 with discount each 4 tickets. The total at checkout was $281. Some discount😡 I backed out and for the same proximity on geek the tickets that showed $60 plus per each of 4 tickets plus a $14 fee totaled out at $241. The process was quite simple. The math on Geek seats was quite a delight compared to the deception of Vivid seats. Always easy, always fast I love it! Ordered tickets for a game tomorrow no tickets yet. My son has to drive and doesn’t want to go if he doesn’t have the tickets. No help from Seat Geek or seller group Will never use them!! Great! Here are some tips. I bought 3 tickets for the 2018 Jingle Ball concert a couple weeks beforehand. I’ve seen 1 star reviews and I was pretty nervous about getting scammed. But my tickets were good and I had a great experience. I suggest that you buy E-tickets so that you can get in with your phone and that the tickets are from SeatGeek and no other seller! I hoped this helped. Love this app !!!!!!!!!! Where’s it been all my life! I always check in this order: Ticketmaster StubHub SeatGeek I find the seats I want and SeatGeek usually has the best price and let's me know if I am getting a good deal or not. Definitely my go to ticket app. 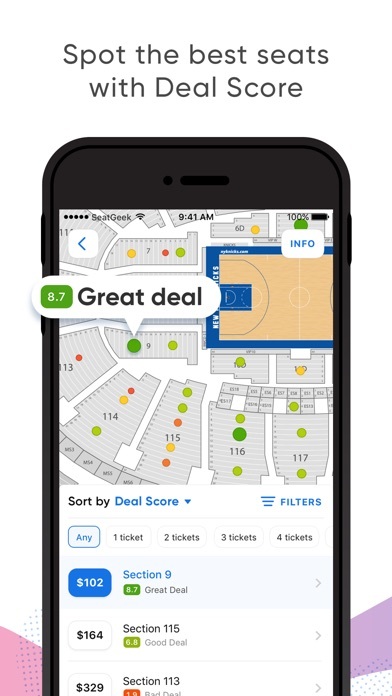 SeatGeek makes it easy to find deals, especially really great seats. It can happen. I own 6 season tickets for the New Orleans saints football team. I would often miss the kickoff because my kids were running late for the game. I found myself waiting outside the stadium for them to get there. Being able to send the tickets via seat geek to there phone is very convenient and nice. 👍👍 that’s a 2 thumbs up!!!! It’s an alright app nothing spectacular about it. Bought tickets to the Conor McGregor Vs. Khabib fight back in August. Didn’t receive my ticket until the day before the fight(October). It’s nerve wrecking when you pay so much and no one can give you an update on your ticket. Also they make it harder than it needs to be one of their sellers called me and asked if I wanted to upgrade for $50 more. I kindly declined and said I’m happy with my ticket and he got frustrated with me hung up and called me back to say he sent the ticket. Other than that big roller coaster you go through they did offer the best value. I’ve bought tickets to 2 events so far and shopped around online, looked at Ticketmaster and this app finds the best deals available by far. I love the app and how accessible they make it, I bought Miami heat tickets for $40 apiece & knew exactly what I was getting as far as viewing goes. My only complaint is how I got my tickets from seat geek, but then had to go through Ticketmaster as well to actually receive my tickets. Once I got my email, I downloaded my tickets to Apple Wallet which made everything super easy! I have used SeatGeek many times and could not be happier. I particularly like their rating system which I think is totally accurate. This is my go to ticket site. App is easy to use and I always find seats I like. No problems encountered. Always easy and always a great experience! If u need to save chump change & go crazy with other parties before the event this is the app for you! I personally will never use it again & will gladly delete it after this review. What a disappointment 👎🏽 Don’t trust any justification they might right in response to this review. If you do believe it you will find out the hard way! Love the easy and quick purchase, I wish fees would be included in ticket price initially. Very simple to find what you’re looking for. Just use stub hub. I purchased tickets for $160 and it failed to go through. They said I have to wait 3-5 business days for a refund so I did. After 6 business days I called back and they said it will be another 3-5. Save your self time and use StubHub or any other app just not this one. SeatGeek is such a clean interface and makes event attendance more enjoyable and easy. The only place to get tickets! I’ve tried them all. This is the best by far. I’ve used this app for a variety of events and has always been a breeze. Great prices and smooth transactions! I just bought tickets for an MLS match. The same resale seats were listed on SeatGeek and the stadium ticket office. I saved $50 buying through SeatGeek. I had 2nd row seats to see Childish Gambino, stoked beyond belief. Then SeatGeek sends me an email saying the purchase has been cancelled and I will be refunded. Good thing I checked my email! Now I have to move to the other side of the stage and move quite a few rows back for the same price. Thanks a lot SeatGeek! Don’t sell tickets that you can’t promise to people. We were trying to find tickets for the Sugar Bowl and SeatGeek has the most competitive prices and very easy to purchase. Excellent service. It’s really easy to use and they seem like they have the best prices on seats! Top seats for a cheap price!! Super fast - easy - safe and hassle free. No meeting up to make exchange for tickets. Only way to get tickets!! Quick and simple. Do it. I would NOT recommend buying tickets from this app, I tried purchasing NFL tickets for me and my two you sons. The tickets were shown on the map in the lower level, come to find out we were THE LAST ROW at the top. They were so upset and this company took zero responsibility. And was absolutely no help. Buyer beware. Shady operation. We have been using this app for over a year and have always enjoyed the easy access of the app and seats available. This is how I buy all my tickets for events. I love how affordable and easy and quick it is to get great seats !! I’ve been planning to go see the buttertones , the japanese house and pale waves in December. I decided to check out seat geek, and let me tell you, it’s super overpriced. In the order of the concerts these are the cheapest I found on other apps and then seat geeks cheapest $12;26, $20;74, $18;42. Like man, i wouldn’t recommend this to anyone honestly, I would recommend songkick, has way cheaper prices. Most tickets through aggregation. Delivery and ease the best. Seat Geek has perfected online secondary market tickets sales. I was a little bit worried at first this would be a same but I bought tickets to a penn state game and I actually went and got in now I trust them and won’t use anyone else!!! Never sell on seat geek!!!!! I’m a Saints season ticket holder. I’ve been trying to list 2 of my tickets on seat geek for over 2 weeks now without any luck. I’ve called at least 6 times now and talked to different staff members but no one can figure out the problem. Its frustrating spending hours on the phone with support staff and having my ticket possibly not sell now since this has been going on over 2 weeks. Has seat geek offer any compensation for there technical issues? Of course not. Great tickets for a great price and the score feature is awesome for a venue you haven’t been to. Best way to buy tickets for sure. Just use it. Do it. I downloaded seat geek and searched “Bts” it said “NONE” the week after that it said that the concert passed! I tried again, there was tickets at first it said $504 and when I went to checkout is said $2,466.00 each! Knicks vs Hawks tickets ! So easy to search...fees aren't bad...selection is great...works seamlessly...love this app! Easy to use. Love the seat vantage points. I use this app for all my sporting events I attend. It’s fast, easy and convenient. I usually always find the best prices for tickets on SeatGeek. I love their format of ticket listings. I spent a hefty sum that required the delivery of hard tickets a week prior to the event. For some unknown reason, SeatGeek sent the tickets via UPS 2-day air, which arrived the afternoon prior to the event (4 days from ship date). The tickets were damaged and without bar codes - completely worthless for entry. After immediately escalating to SeatGeek, I was informed that the tickets were sent in good form per UPS. No refund, no guarantee, nothing. Please don’t confuse this site with the more reputable ticket agents. SeatGeek did nothing to remedy my problem, and I spent several hours dealing with what felt like an outsourced customer service operation. AVOID!!!!! Ease of use, ability to sell tix easily are the best features. Loving this app. I’ve used it multiple times and had zero problems. Keep up the good work. It’s great thanks to SeatGeek I’m going to my first concert!!! Must have app for sports fans! Easy to use, quick entry into games, love this app! I love this app. So easy and reliable. I’ll never delete it. It’s better than vivid seats! Terrible customer service and ticket delivery methods! I bought tickets 2 months ago for a UFC event and 5 days before the fight, I still have no tickets available!!! I recently bought a ticket off seat geek and it denied at first so I retried it as it gave me the option and it ended up charging me for two tickets. I proceeded to write them an email so they could offer a refund because it was clearly the apps fault and they refused. Never again. Buy your tickets elsewhere. Stick to stub hub. I love how easy it is to get tickets from SeatGeek! SeatGeek always shows the best deals. And when I buy tickets from SeatGeek I know that the tickets are authentic. And SeatGeek has tickets for every event. Its always a great experience on the app! Also use promo code DOBRIK OR VIEWS for 20% off your first purchase. Best company and app for resale tickets. Have never had an issue with getting tickets and I love that they show the price with fees included and an example of the view from your seat. With SeatGeek! I’ve used them for sports and concert tickets numerous times. Always great. I have used this site twice so far and both times I had no issues. I love this freaking app! SeatGeek makes sure you get the best value out of your money no matter your price range. The app is easy and always works. It’s the only ticket service I use now after trying all the others. I have had nothing but great success both buying and selling on SeatGeek. Love it!! Best way to get tickets. So easy to use. Smooth, quick and easy transaction. Love the layout and rating system! My ‘go to’ for quality tics. SeatGeek app is simple and easy. Love to use it for upcoming concerts! I’ve been to 3 concerts using them. I always prove check with other places and the tickets are waaayyy cheaper. I’m only 19 and when I first started going I had just turned 18. So cheap is a good thing for me. College students don’t have money. And I never write reviews but SeatGeek deserves all the credit. They show you good seats based on people’s experiences and they have amazing prices. They even let you see the prices with fees included so you’re sure you can afford it and not shocked at the end. If you wanna go ANYWHERE use SeatGeek. They have never let me down. Awesome, the fees are getting a little too steep thought. I use SeatGeek for all of my concert and sporting event tickets at home and when traveling!! It’s convenient, prices are competitive and the in app delivery makes it so simple!! seat geek itself is the worst ticketing website ever to exist. i bought tickets labeled as GA or “general admission”, but when I received the tickets they were actually for the club level, which is NOT what I paid for. their customer service is terrible, they lie about the tickets they have available, and it takes forever to actually receive your tickets. screw seat geek. Very convenient app. Makes buying and selling tickets a lot easier. Easy to use. I love the including fees option to help shop for tickets! I’ve used SeatGeek for just two years now and have loved every minute of it! They always have the best seats for the best prices! In my 50+ ticket buying experiences with SeatGeek, I have never once had a subpar experience! My tickets have always arrived in my inbox in a timely fashion regardless if I bought them a month before the event or 20 minutes before the start! Thank you SeatGeek! Easiest way to but tickets! My daughter purchased tickets for the 2019 Rose Bowl the tickets ($110 each) clearly state to pick them up from the seller at the venue, contact for the seller is 9788853484 Argeny Vargas.. I contacted this person on 12/31 at 5:01pm letting them know the tickets were purchased for me and asking if my daughter had to be present to pick them up the response I received at 5:05pm was no she didn’t and he would be to the stadium early to pick up the tickets. Day of the event 1/1/19 we get to the rose bowl paid $60 to park contacted the seller at 1:36pm to meet and pick up this time my husband called him and he answered stated he was at will call picking the tickets up.. keep in mind we had been told that he would be picking them up early... after that phone call we never heard from him again my husband texted and called my daughter tried to call him and text him no response at all.. my daughter then called seat geek and spoke with a rep and told them what happened they tried to contact the seller nothing she asked for a refund and was told they could find her different tickets and she said sure so they found tickets a little higher up from the original tickets and the seller would call me we waited until 3:00 and no contact per the rep we were given another number to Matt (678) 387-0902 called him he was at the game in lot H and said he didn’t think he had a rep to meet us to give us tickets... at this point it was almost 3:30 and we had already missed a good portion of the game as it started at 2 i then told my daughter to just ask for a refund and we would leave. This is a joke of a website maybe they should verify the sellers before alloying them to sell on their website. I have advised my daughter to make sure to watch for the refund on her credit card. Will never use this site again and my daughter has now deleted it and we will never use or allow anyone we know to use this app to purchase tickets. Quickest way to buy and let’s you compare other site prices with ease. Extremely user friendly. I can be chatting with friends about attending any sort of sporting event, quickly look up what it would cost to attend, and easily understand if I’m getting a good deal or not based on the color coding mechanism. Highly recommend as the one-stop shop for buying tix on the secondary market. Gives you the best prices to every event you want. SeatGeek is one of the best apps to buy tickets on. It’s user interface is super simple and when it’s even time pulling your phone out to show the tickets couldn’t be any easier. The most streamlined way to buy tickets for any event. Waaaaay better than ticket master!! Easy to use app. Reasonable fees. Fast check-out!! Seems to be a good app to get tickets at a good price! I yet haven’t bought any tickets from here for anything but I am looking at a event to go and usually Ticketmaster would always sell tickets for this event but this time I’m not sure why not. The thing I love about Ticketmaster is StubHub is I’m able to see and or choose the seats vs here I been trying to figure out where my seats will be, it shows me the row & section but I care more about the seats. I don’t know about other people but I don’t want to buy tickets & get stuck sitting in the middle of a row with 20 people and keep getting up for food, drinks or restroom breaks. I don’t want to pay and find out after where my seats are at. If your able to fix this issue then maybe this wouldn’t be a issue for me or maybe others with this similar thing. I love that Seat Geek keeps me updated on events I am interested in, and gives me an opportunity to score great seats for an amazing price. I’ve purchased tickets through Seatgeek multiple times and have never had any issues. Tixx are usually transferred within an hour, sometimes less. Don’t think I’ve ever waited more than 12 hours to receive tickets. Great seats and great prices!! Way better than StubHub.. Best in the game. Simple, user friendly effective layout, No glitches..Love it. Idk what else to say..
Never use this app; doesn’t even deserve one star. They are by far the worst company (criminal the way they do business and allow others on their site to conduct business). They should be shut down. Love it for great last-minute deals or sold-out events. Always love using this app! Quick and Easy! Best place to buy tickets. Love this app so much. Only thing I don’t like is the Fees but I understand. Bought tickets to an Elton John concert about an hour before the show and despite giving my credit card info and “buying” the tickets I had to wait for the email to download. By the time I finally got the email, which instead told me that the buyer couldn’t get me the tickets (they were probably being sold on multiple sites), all of the good tickets had been sold. Ended up paying more for awful seats, I won’t use this again. Cuts out a lot of the clutter of Ticketmaster, StubHub etc. Very easy to use! My $336 ticket transaction was rejected. Yet, SeatGeek charged my bank account card 3 times for that 1 undelivered ticket, totaling over $1,000. My credit card transaction was also declined, then as a result of SeatGeeks suspicious activity, my card was suspended. Now, I do not have a ticket and I have no way to purchase a ticket elsewhere. SeatGeek has no phone number to call. They never responded to my email. Im out $1,000 plus no ticket. SeatGeek is irresponsible and Simply a Scam. The option to have fees included in the price before you get to check out is AWESOME. Kept hearing about SeatGeek on PMT and now it’s just my go to for checking out events very user friendly and great prices! Seat Geek was super simple and fast to use. Seat geek gets me the best tix for the best price every opening day. Awesome deal great app use it all the time!!! Easy way to see what your price options are, assure you’re getting a fair deal and an idea of the seating view. Love the app! I liked Seatgeek much better when they didn't charge a fee for tickets. That's what put them ontop over the rest. Now that they charge a fee for every ticket I check all the rest of my options for tickets or just don't go as much. Super easy. Move the ratings option. Tickets delivered in a hot second. Great site for tickets and venue information. This app is super easy to use and really convenient, download it and start getting great tickets with ease! Website had issues w iPad and iPhone. Downloaded app and all worked perfect. I buy a lot of tickets at the last minute because I travel a lot for work. This app always connects me with great deals and is beyond convenient to to use!! 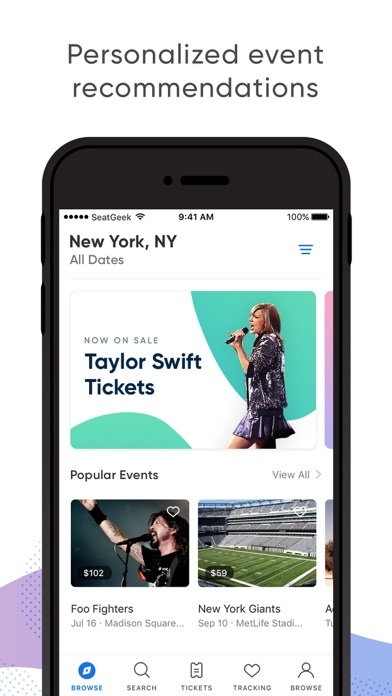 Great app to purchase tickets for all kinds of events. Haven’t been disappointed yet. I very much so like the clean and fast responsiveness of the app but one way to improve it would be to make more tickets purchasable using promo code. It seems like many use some third party system that doesn’t let me us promos on it. I love the interacting seating feature. And you can use your cell phone to show your ticket.